QC Family Entertainment Center offers upscale event spaces, sophisticated menus, full-service bars, and cutting edge audio visual systems. Our party packages offer catering, beverage and entertainment options to accommodate any party. Our 48,500 square foot facility features a total of 32 bowling lanes. 24 in which are laid out in the conventional style along with 8 lanes in a boutique style equipped with leather couches all in its own private area for league, open, and corporate bowling! In the game room there are more than 65 state-of-the-art video redemption games with a redemption center to redeem prizes ranging from Slinkys to iPads. Oh, and you can’t forget to check out our one of a kind 2-story laser tag arena! Looking to have a birthday party or a place to host your next corporate party? No problem for our party coordinators and the 2,000+ square feet of combined party / banquet rooms that can also be divided for smaller groups or conferences. Inside you will also find Frankie’s Sports Bar & Grill that serves the Miroballi Family Chicago-style pizza! 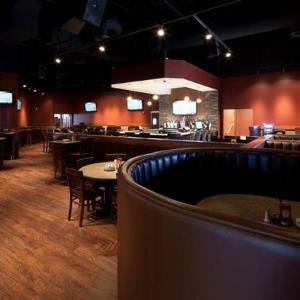 The restaurant is large enough to accommodate 120 people, features a full service bar and 10+ high definition big screen televisions to satisfy your sports cravings!